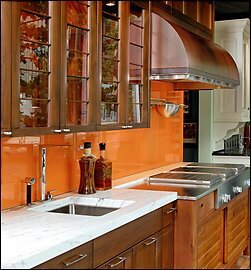 The big trend emerging in Kitchen design today is the absence of tiles and substituting it with the back painted glass. The glass backsplash painted in a colour of choice is a great way to create a modern looking kitchen – even in combination with wood, it looks very contemporary and easy to maintain. This entry was posted on October 6, 2008 at 4:02 pm and is filed under Design, Kitchen, Kitchen design, modern kitchen. You can follow any responses to this entry through the RSS 2.0 feed. You can leave a response, or trackback from your own site. It’s also very easy to keep clean – no grout lines or crevices to worry about.